"The hotel is in the city centre, surrounded by great local f..."
Have a question for Seeharaj Hotel? "Everything was great, clean, attentive staff." "Good location near the mall and market." "All the staff were very friendly and helpful." 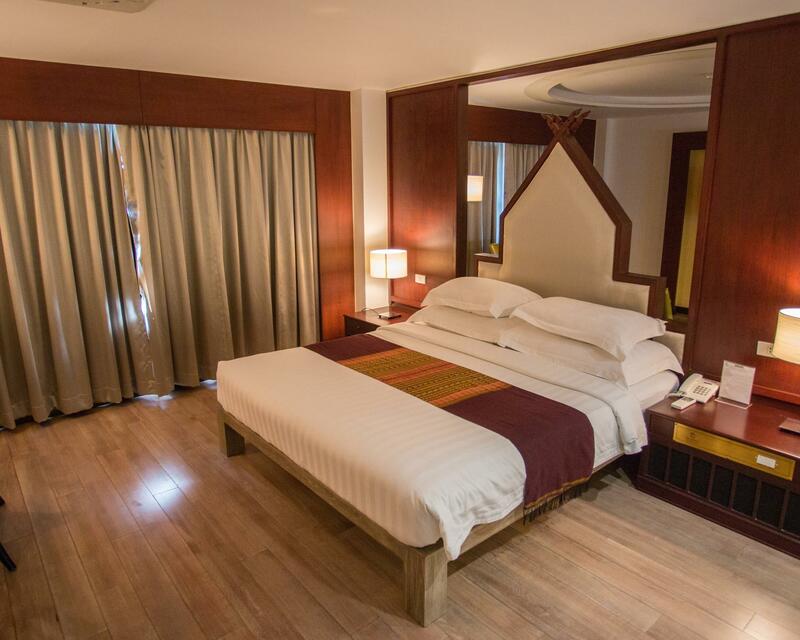 This city center hotel in Uttaradit offers clean and comfortable accommodations suitable for both business and leisure travelers. 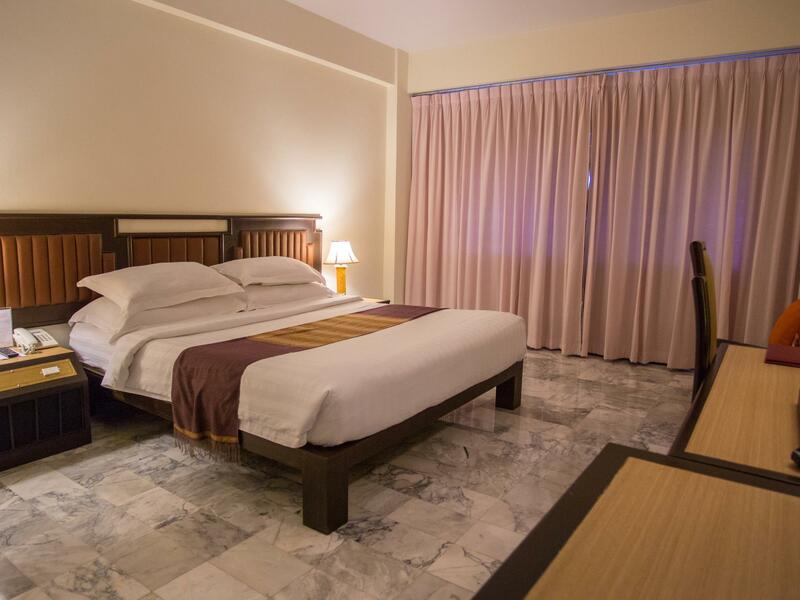 The Seeharaj Hotel is located in Uttaradit’s central area, making it a convenient base for business travelers as well as holidaymakers passing by the province. The hotel offers modern guestrooms a high-rise hotel building with facilities such as an outdoor swimming pool, a fitness center, and the Crystal Discotheque which perfect for unwinding at the end of a long day of business negotiations or exploring the town. The Seeharaj Hotel is regarded as one of the province’s premier modern accommodation that is on par with international standards. Please enter your dates on our secure online booking form to make a reservation at Seeharaj Hotel. "Very good option in good location"
Breakfast is provided for 2 persons per booking. Any addition person will be charged an extra fee of THB 235 for adults, and THB 150 for children under 9 years old. The hotel is in the city centre, surrounded by great local food. There is no kettle and hair dryer in the room. Fitness centre is under refurbishment but still can use the treadmill. The pool is too crowded to use in the evening. There were swimming class everyday when I was there. No pool towel provided. Breakfast is just good enough to survive but don't expect too much from it. Coffee shop has some really good coffee and cake. The elevators make loud noise, alarm like, every time they stop at any floor. My room is almost at the end of the hall way, but still can hear that noise clearly. Everything was great, clean, attentive staff. The breakfast had a little problem, all the eggs that came from the kitchen were cold. My wife and I come back to Uttaradit every year for a variety of reasons one of which is family. We choose to stay at the Seeharaj for several reasons. First it's a great value for the cost. The morning brunches are fine but not perfect. They often forget to keep the food hot. But if you need something special from the kitchen they always seem to oblige. The staff are always great. The rooms are clean and comfortable. And on top of it all they have a nice pool where I always find myself in doing laps. Great location as well. I really think of this place as home. My wife and I travel to Uttaradit every year to see family. We enjoy staying at the Seeharaj Hotel for several reasons: great value, clean swimming pool, breakfast buffet, and clean accommodations. My only complaint is that some of the food, for breakfast, is served cold when it should be served hot. I hate cold eggs! Otherwise the staff is great and we love the central location. My wife and I always stay at the Seeharaj when we are visiting Uttaradit. It is a great value for the money. The rooms are clean, the breakfast is alright...better if they kept the food hot...the food is always cold which I hate. The pool is great and the staff very attentive. My wife and I visit our Dad who lives in Uttaradit. The hotel provides a very comfortable stay. Each morning we have a buffet breakfast. The pool is clean and perfect for lap swimming. At night you can enjoy the club that is part of the hotel. Great staff and good value for your money. We stayed at this hotel for a friend's wedding in the nearby town of Tron. Hotel was in good location as it was in the main city and only takes a few minutes to sights such as temple and train station by taxi. Staff was very friendly and assisted us with any request. Room didn't have tea and coffee facility but they do provide hot water if requested. Great hotel, only downside was bed was slightly hard for our liking - but that's our own opinion. My family and I stayed up here right after the renovation's just been done. So the rooms are very very clean even though furniture and other facilities obviously show that this hotel has been serving guests for very long time. The atmosphere is so perfect You can feel all the warm welcome of the Thai's northern culture. Breakfast consists of ordinary dishes includes Thai, Chinese and Thai;fried eggs,sausage,bread, Thai rice soup with mince pork and more.Beverages are coffee,juice and fresh water.Bellboy is very good at his job. It's my family first good impression. However, the receptionist is unprofessional. I made a call to check that the rooms are still available for our family because we'd arrive quite late at night. But as soon as we arrived there, the bellboy is the one who mentioned about the smell of color painting due to the renovation. He suggested us to go and check the smell before bringing all belongings out of the car. I was so pissed off because the receptionist never mention anything about that. I went to ask the receptionist what if I can't take the smell but he just said nothing and pretended to ignore my ask. This hotel and Friday hotel owned by the same management.Seeharaj is the older of the two. A little blast from the past in the decor and clearly was the place to be in it,s day.Staff very friendly and live music of an evening. All togehter: okay. But under the bed very dirty and under boxes beside beds same: dirty. Someone should teach room maids how to work well. Maybe not importand for hotel staff??? Room was ok with basic breakfast. I moved for sunee boutique hotel, The place is where i need. Good location near the mall and market. Clean and good light. Good pool. Good to stay here. I ll back again. Staff were limited in English but were very helpful. They have a nice restaurant, big swimming pool and a basic breakfast (more asian orientated. The rooms are a little dated but large and comfortable. There is also a bar and a large nightclub with live music. Plenty of parking and close to many shops and quiet near all facilites. Great helpful staff, dining room with entertainment and large pool. Convenient to some temples, the railway station and local street food. A great lightshow that night thanks to a thunderstorm. The hotel is located right off of the main street, so it is easy to get to upon arrival. The rooms are large although a bit dated. They are clean and the shower was hot with great water pressure. The reception staff was not very helpful in providing directions to a nearby restaurant, but this was likely a language barrier problem. The breakfast in the morning leaves one unsatisfied. However, overall you get what you pay for here.